The US also wants to extradite him from the UK over his alleged role in one of the largest ever leaks of government secrets in 2010. But Assange's legal adviser Greg Burns, says it is by no means certain that the UK will comply with the request. "There have been some decisions in the UK courts in which the courts have been very cautious about requests by the United States, in particular because the United States has a habit of extraditing people and then when they get to America then they decide to charge them with further offences," he said. Assange is due to face a hearing over his possible extradition to the US on May 2. His lawyers say they will be fighting against the request, calling it a "dangerous precedent" for journalists publishing information about the US. Meanwhile a group of over 70 British MPs has urged the UK Home Secretary, Sajid Javid, to give priority to Sweden over the US, if the Swedish authorities request his extradition. The United Nations has called for his right to a fair trial to be respected. "We are following the case," Ravina Shamdasani of the Office of the United Nations High Commissioner for Human Rights told a press conference. "We expect all relevant authorities to ensure that Mr Assange's case is dealt with full regard for his due process rights and for his rights to a fair trial including in any extradition proceedings." 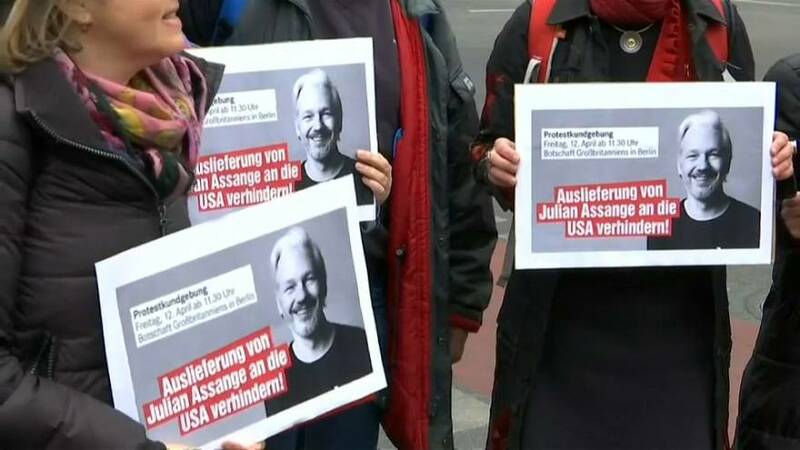 On Friday, several dozen people demonstrated in support of Assange outside the British embassy in Berlin. The protest was organised by the opposition Die Linke (The Left) which called on Chancellor Angela Merkel's government to grant him political asylum in Germany.